What struck me during this year’s PRSA International Conference in Orlando was that almost none of the 100+ pr practitioners that I met, did what everyone was talking about. Almost none of the sponsors of the conference, who’s offering pr-tools, really offered what the speakers was talking about. Almost none of the speakers, I heard, recommended the pr-tools that the sponsor offered. Isn’t that a great paradox? Or/and just a shift? So what was everyone talking about? “Engagement” of course. Engage with the people that matters. Find them, listen to them, understand their needs, serve them and treat them as humans, because they are humans, like everybody else. Not once in a while. But continuously – 24/7. They were talking about engagement with influential people. Particularly about people with more influence than others. Some of them are (still) journalists. But these day, many of them are thought leaders, customers, industry spokesmen, blogers, and others, or a mix of these as well. Words and phrases like “conversation”, “social media”, “share”, “followers”, “trust”, “transparency” and others, all of them intimately connected with the concept of “engagement”, were on everyone’s lips as well as on banners, magazines, give aways. Unfortunately – I think Pitchengine stumbled at the finish line when the company claimed to deliver the entire solution as “the real thing”. Because they don’t. Maybe they should have written: “What I need is to show engagement”, and also offer that kind of platform? 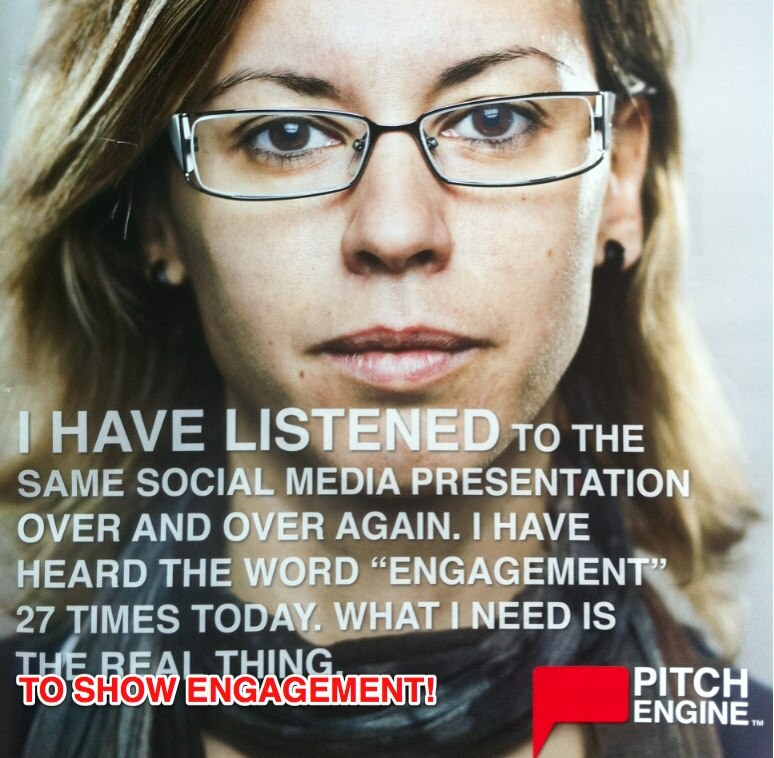 But Pitchengine offers a sharing platform for content. Maybe one of the hottest on the market right now. And invites their audience to “create your own media empire”. Great! But where’s the real engagement thing? Marketwire, Businesswire, Cision, PRNewswire, Vocus, Meltwater Press, Mymediainfo – they’re all stucked in their solutions in terms of mediadatabases and distributionslists. Some of them, like Meltwater Press and Cision (Cision Influence), have added (or will add) value to the profiles of the targets, in form av their social preferences and previous works. And that’s great, as well! But – still – where’s the real engagement? As a matter of fact, all of these companies (still) offer their clients “management tools” with which they can organize and manage their “target groups”. Most of them are offering monitoring services to let their clients get an idea of what’s going on out there. Some of them are brilliant, like Traackr, which let their customers to find their most powerful influencers. But – then again – what happens with the real engagement, in terms of understand and serve this VIP’s, based on what they’re saying and eventually asking for? As far as I can see and understand, the real engagement take place in communities and networks, not in or as a result of “management tools”? Chris Brogan – one of the key speakers at the conference, and the author of “Trust Agents: Using the Web to Build Influence, Improve Reputation and Earn Trust” recommend his audience to use Google Reader to build their “listening stations”. Exactly what Eric Schwartzman, co-author of “Social Marketing to the Business Customer”, did during his Social Media Boot Camp work shop. “Once you have determined where your community is on the web, or perhaps after you’ve built your own online presence as a meeting place for a group that doesn’t yet have a place to belong, the next step is to engage a community. This community may be a loosely joined group of people with individual minds and opinions who share some common interests or passions via their own unique perspective. Listen comes first. Pay attention to where people (that matters to you) interact. Take small steps. The first actions you make shouldn’t be intrusive. You just want the community to know you’re there and you’re friendly. Create opportunities for small, memorable exchanges. Build you profile as someone know by being around and monitoring conversations, recognizing who’s a regular and who makes decisions. Lead a new initiative. When the time is right and you’re a bit better known, try making a move to bring your self more into the center of things. So why do PR practioners insist to organize and manage their fellows rather than engage with them? I just don’t get it. Chartered in 1947, the Public Relations Society of America (PRSA) is the world’s largest and foremost organization for public relations professionals. PRSA is responsible for representing, educating, setting standards of excellence, and upholding principles of ethics for its members and, in principle, the $4 billion U.S. public relations profession. The PRSA International Conferences are one of the largest and most renowned in the U.S PR industry.